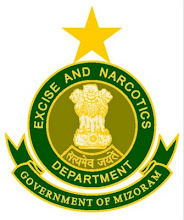 Aizawl, Apr 12 : The Excise and Narcotics Department earned a revenue of Rs 231,80,631 during 2011-12 from different sources, including confiscation of liquor, in Mizoram, which is officially a dry state since 1997. During the past year, the department seized 54017.195 litres of country-made liquor, 99723.5 tins of fermented rice, 303.062 kg of yeast. They also seized 78737 bottles (of 750 ml size), 251 bottles (of 375 ml size), 79 bottles (of 350 ml size) and 220 bottles (of 180 ml size) of Indian made foreign liquor, and a large quantity of foreign and Indian beers. The excise police also seized 79 two-wheeler, 13 three-wheeler 199 medium and 10 heavy vehicles used for transportation of liquor and drugs. The excise police also seized 1.36 kg of heroin, 2.9 kg of opium, 162.44 kg of ganja and huge quantity of pharmaceutical drugs like spasmo proxyvon (19148 capsules), parvon spas (388205 capsules) commonly abused in Mizoram. During last year, the excise and narcotics police arrested 353 people under the NDPS Act 1984, 289 people under the NDPS Act 1985, 452 people under Assam Drugs (Control) Act 1950, 370 people under the AD(C) Act 1950, and 3149 under the Mizoram Liquor Total Prohibition Act/Mizoram Excise Act 1995. These included 84 foreigners, mainly Myanmarese nationals.